Among Langs who directed, there is Fritz who we know well, and Walter, who’s near forgotten. The latter was a greater success in his lifetime though. He made singing hits with Betty Grable and Alice Faye and was well liked in the bargain. Both Walter and Fritz spent time at Fox. Staff there nixed Fritz and revered Walter. Were posterity to act in accordance, we’d fuss more over Mother Wore Tights and less about Metropolis. Nice guys often finish last on director pantheons. Maybe the Walter Langs were taken up more with cultivating friendships than carving out personal visions on film. Compromise enabled comfort and Walter enjoyed his beside a swimming pool in retirement. Did historian indifference matter to him? One that remembered was Joel Greenberg, apparently the sole writer to look up Walter Lang and interview him in depth before the helmsman died in October 1971. That profile appeared in Focus On Film in 1974 and again in a 1976 collection edited by Jon Tuska, The Contract Director. 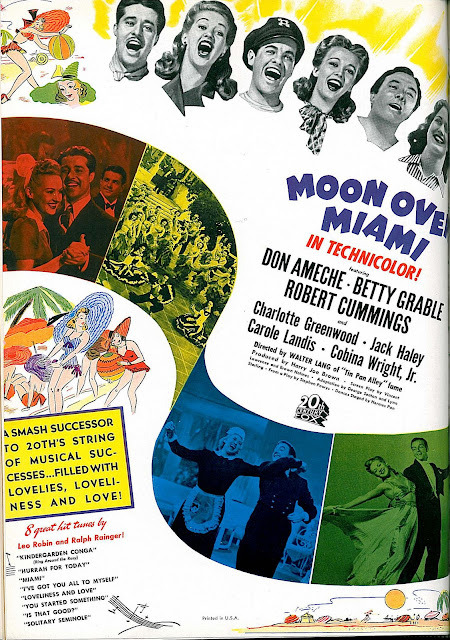 Greenberg appreciated studio work Lang guided and spoke glowingly of Moon Over Miami, Tin Pan Alley, and others the critical establishment ignored. I wonder if he grew up seeing these in theatres, since afterward it was tough finding them properly presented. Musicals at Fox were mostly about Technicolor. Otherwise, they were resolutely formula. I could write about one today, another tomorrow, and say basically the same things. That’s not to claim they’re bad. Last week, I got out three Lang signed --- Moon Over Miami, Weekend In Havana, and Greenwich Village (above is Walter directing Shirley Temple in The Little Princess). All are on DVD and back to at least suggesting candy-box basics they’re known (if at all) for. 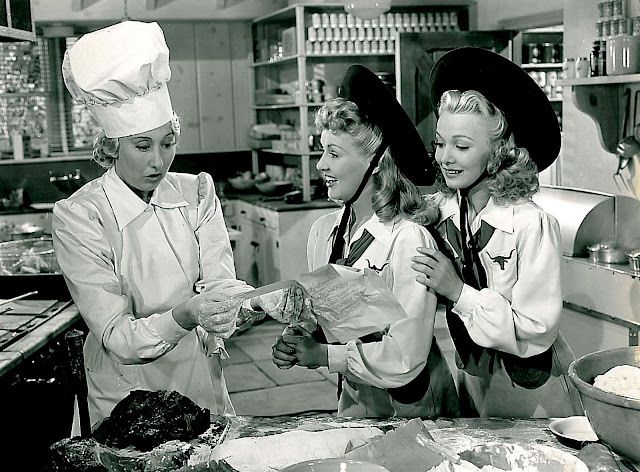 Older folks remember Fox musicals with singular fondness. Grable and Faye kept turnstiles rotating all night then. You’d get off swing shift and make 3 AM shows along with a couple thousand night owls in similar wartime circumstance. 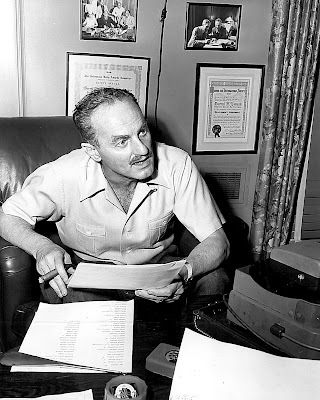 It has always been my belief that the reason we have made a successful series of musical comedies over a number of years is because we have used several formulas effectively, said Darryl F. Zanuck with not a trace of irony over his company’s treading and retreading upon story moulds poured years before (he's seated below with signature cigar). A pinch of Three Blind Mice sprinkled with Café Metropole and Second Honeymoon would disgorge the eighty minutes needed. Fox musicals have at least that brevity to recommend them (Sweet Rosie O’Grady a scant 74 minutes), plus refreshing lack of ambition, which was ruination of sometimes pretentious and overreaching Metro output. Even at reduced length, some of these run just ahead of patience. Stories were three parts misunderstanding and two parts deception. Everyone’s about keeping secrets and withholding information. It falls upon likeable performers to salve our annoyance with foolish behavior imposed by scripters. Fox liked comics as punctuation on every straight line. Jack Oakie and Phil Silvers are tireless sidekicks to interchangeable leading men John Payne and George Montgomery, among many such combinations, and clowning cameos of a Billy Gilbert, Leonid Kinsky, Jack Haley sort were factored into each with mathematical precision. Vaudeville would not die so long as Fox did musicals. Neither would songs of an age otherwise vanished. Zanuck might as well have titled all of them Tin Pan Alley for negligible difference in tune and content. Why be experimental when product was paying like this? DFZ knew the value of travel folders in motion during a war. He’d dispatch second units to exotic climes for three-color vistas of places travel-restricted viewers couldn’t see for themselves. Ration watchdogs asking Is This Trip Necessary? were answered a resounding Yes by patrons taking vicarious pleasure in vacations enjoyed by Alice Faye and Betty Grable. Combining said wish fulfillment with Technicolor’s novelty and song/dance stimulation was foolproof siege upon a public’s disposable change for as long as that perfect storm of a world conflict lasted. Conclusion of it made everyone wonder what had made Fox musicals click in the first place, so changed were conditions and a postwar audience’s taste in movies. There’s not a Singin’ In The Rain or Meet Me In St. Louis among 40's Fox musicals. They were ephemerae least likely to be revived after the war. A few came back for reasons other than those that drew audiences in the first place. Sun Valley Serenade and Orchestra Wives supped from wells Universal nourished with 1954 hit The Glenn Miller Story (he’s in both), while Rita Hayworth’s stardom enabled reissue of My Gal Sal (and $167,000 in added domestic rentals). There was a 1974 try at duplicating MGM’s That’s Entertainment franchise, Fred Astaire Salutes the Fox Musicals, which played television outlets using the company’s episodic mimicry, That’s Hollywood, a short-lived series featuring clips from TCF’s backlog. Astaire seemed almost embarrassed putting a hard sell on also-ran musicals trying to compete with those he’d made at Metro, leaning most on a single one done at Fox, Daddy Long Legs, from 1955. The biggest latter-day noise any Fox musical made was in 1972 when independent distributor Eric Spilker leased rights to 1943's The Gang’s All Here and made it an unexpected sensation among New York aesthetes and those pretending to be so elsewhere. It’s about the only vintage Fox musical people talk about anymore. 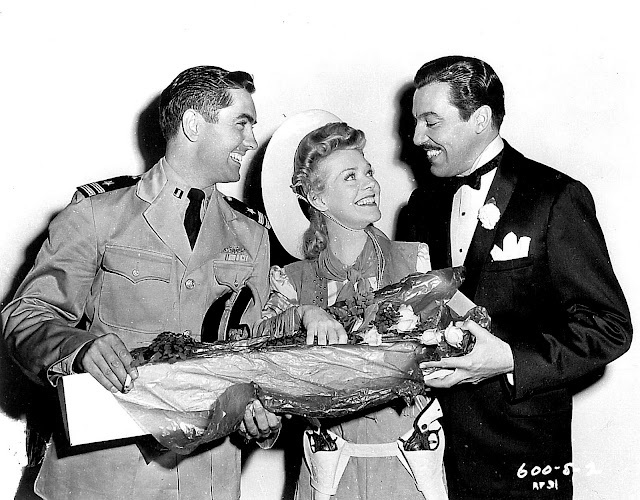 Those who remembered Spilker’s 35mm three-strip Technicolor prints offered loud protest to washed-out DVD’s Fox offered as part of an Alice Faye set. 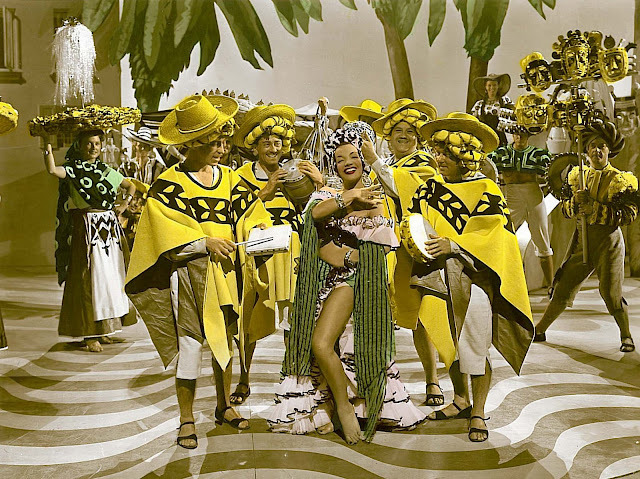 Some improvement was achieved via later remastering for the Carmen Miranda box, but how can proper color be restored with original separation negatives long since discarded? DVD musicals from Fox have consequently been mixed bags. Where good elements survive, they can at least simulate color first-run crowds enjoyed, but too many have run Eastman reprint gauntlets and will never look again as they did on three-strip. A Technicolor moment etched deepest in my memory dates from 1974 when I threaded a 35mm nitrate Coney Island trailer on a chain-driven DeVry military surplus projector (which by sheer chance didn’t burn my parent’s house down). The color I witnessed that day was almost supernatural. Nothing has approached it since. The trailer’s long gone (well, so’s the projector), so I can’t duplicate the moment, but it did give me at least an idea of what attracted audiences to Fox musicals. The fact we can no longer duplicate their experience makes analysis, let alone criticism, a pretty futile (and unfair?) proposition. FRED ASTAIRE SALUTES THE FOX MUSICALS used to turn up occasionally in syndication in the '70s and early '80s, and it was actually a fairly good showcase for numbers from Fox pictures. It included tantalizing glimpses of scenes from some films that were (and are) difficult to see, like Chevalier's "Straw Hat" number from FOLIES BERGERE. Your statement "even at reduced length, some of these run just ahead of patience" sums up my exact feelings about the Fox musicals of the era. I bought all of the Fox Musical DVDs released during the last few years - but with just a few exceptions (ALEXANDER'S RAGTIME BAND and ROSE OF WASHINGTON SQUARE being the most notable) - I find them very hard to watch. As you noted, it also is very telling that one of the most creative behind-the-scenes talent the movies musicals ever had just did not succeed at the studio or with their public: Busby Berkely. Yet ironically, THE GANGS ALL HERE is the best remembered and most frequently-revived Fox musical of the era! If memory serves, "Fred Astaire Salutes the Fox Musicals" had maybe half the luster of THAT'S ENTERTAINMENT because the Fox anthology used 16mm TV prints instead of 35mm vault elements. 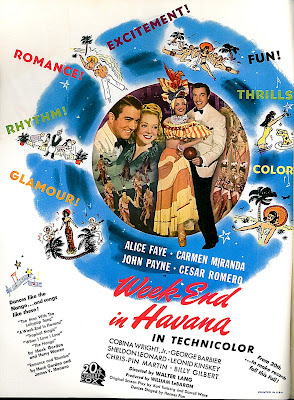 I remember a Technicolor Carmen Miranda highlight being shown in black-and-white. At least they included the Ritz Brothers from ON THE AVENUE! I appreciate your take on Walter Lang. 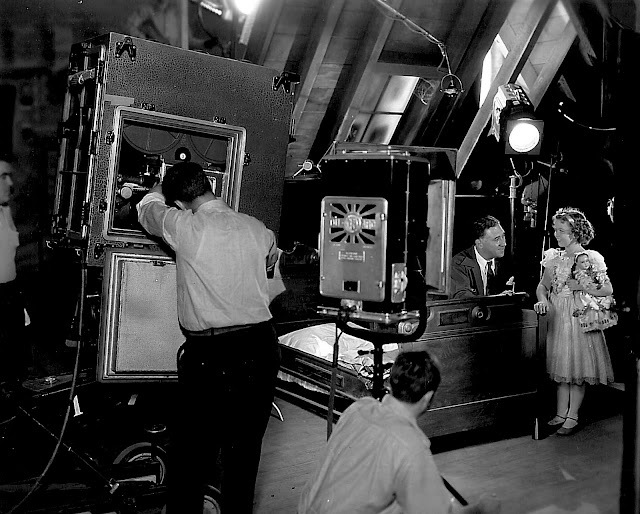 He and cameraman Leon Shamroy collaborated on TIN PAN ALLEY (my favorite Fox musical). Lang's reputation for making pleasant, commercial musical comedies may have been the reason he was tapped 20 years later for SNOW WHITE AND THE THREE STOOGES, again photographed by Shamroy. Griff, do you suppose FRED ASTAIRE SALUTES THE FOX MUSICALS is even available for broadcast today? Richard, I find it interesting that Fox kept a number of deleted songs from their musicals, but junked so many three-strip negatives. Go figure. Scott, I remember going to see SNOW WHITE AND THE THREE STOOGES when it was new. One of these days I'm going to do a post on it, as I have some interesting images to go with it. Possibly another exception to the old wisdom that Civil War subjects lose money?---Schneer and Harryhausen's "Mysterious Island"! I personally loved the way that the film veers from a rather realistic story grounded in a depressing 'reality', at the outset, dramatically escapes this entire milieu and achieves a freedom that the soldiers themselves have won, with the wide Pacific and its magical islands providing the greatest-possible contrast to the hellish, rainy Confederate prison (and of course the infamous one, Andersonville, the story later converted to a play, indicates that in those days, prison camps weren't resorts.) Then, throw in the giant animals, and Bernard Herrmann's grand score, and I thought it was a uniquely fascinating film. Of course, I saw the film first, and read the giant tome by Verne, second. There I discovered that the giant animals were not in the original story, but, Verne's characteristic briliance as regards detail and plausible ways in which men dropped from the sky on a virgin island could actually determine where in the world they were, with 19th Century science, plus adapt to their environment in order to survive long enough to construct a floating craft, were very impressive. Back to "Red Badge of Courage", the real ringer of course is Bill Mauldin, the genius kid whose "Up Front", a collection of his Army cartoons for "Stars and Stripes" magazine define to this day much of the feelings the real foot-slogging soldiers had, about the war, the irritating heirarchies, the basic misery/reality of soldiering, proves to be a terrific, fearless (no stage fright, no intimidation in a mix of 'real' actors, notwithstanding Murphy's similar situation) performer. I don't know if you know that Mauldin was great friends with Charles M. Schulz, who he knew during the war, and the story goes that when he learned of Schulz's abrupt demise only a day or two after announcing his retirement from creating "Peanuts" after a run of more than 40 years, he----Mauldin-----is said to have broken down and cried. (Same story I heard about Randolph Scott, when he learned of the death of Cary Grant.) It's in great part the humanity of these artists that makes their work so great, too. Now they're all gone, and it's me who often sheds a tear, remembering them all, and how much they contributed to my growing up. Cinevent always seems to show one of these. Mother Wore Tights has real heart and I enjoyed its easygoing nostalgic family tale as much as a blanket and a warm cup of tea, but the little I saw of Hello Frisco Hello was like watching a Bulgarian variety show-- impressive production, but aimed at an audience so completely NOT me, I found it impossible to get inside the comedy, the music, the drama, the characters, anything, and just stared at it like the audience in The Producers. Maybe Fox could have called their clip show "That's Entertainment?" Michael beat me to the punch re: MOTHER WORE TIGHTS at Cinevent. I loved it. Part of its considerable charm is that it's so contrary to typical musical formula. In this, boy meets girl; they fall in love, marry and stay married. It's their KIDS who have the angst issues. A breath of fresh air after years of countless inane manglings of vinatge Astaire-Rogers plot complications. I'm almost embarrassed to leave this one! 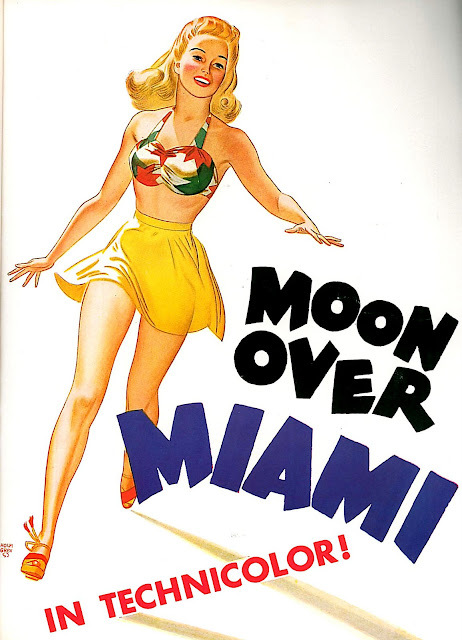 This movie ("Moon Over Miami") inspired one of the sillier names for a breakfast at our local Denny's, about ten years ago: "Eggs Over My Hammy"! I kid you not. I know, I know....but, so many years after the film, I call this a real tribute, of sorts! Here's a funny slant on "Snow White(is it "And" or "Meets", whatever,) The Stooges". I too remember quite vividly seeing it when it first came out, at a not-so-little neighborhood theatre called The Stadium, on Pico Blvd., a virtual stone's throw from The Fox lot. At that time everyone was placing bets as to how much longer the studio would last, because of the runaway budget on "Cleopatra". "Snow White" and some other in-house stuff was being quickly churned-out on lower budgets just to keep the studio running. But I'm probably jumping the gun here, as that no doubt will be the basis of your forthcoming piece. "That's Hollywood" was produced and edited by another boy I went through school with, named Phil Savenick. From time to time I would bump into him and always told him what a great job he did. Phil was the godson of Pandro Berman, by the way, and had started under Jack Haley. Last I heard he was working for Disney. I too love "Tin Pan Alley" and the scene with the principals and Elisha Cook doing "You Say The Cutest Things" is in my all-time pantheon. But I thought that overall, Walter Lang was just the worst. (Sorry, my opinion). 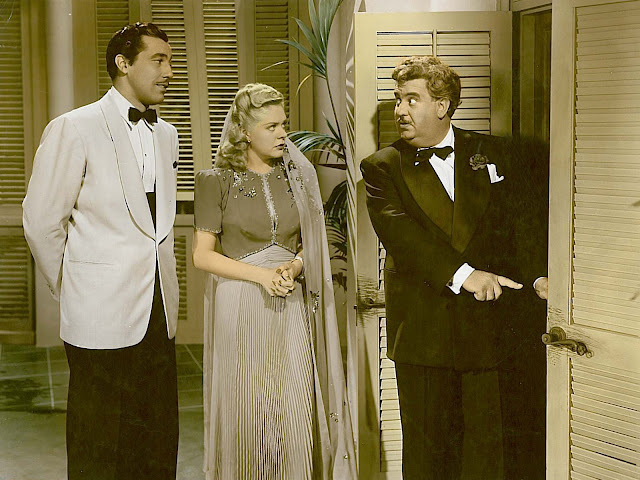 Pauline Kael once wrote that "Without Cary Grant the Mae West pictures didn't have much class", and I think the same statement could easily be applied to the Fox musicals without Tyrone Power. (However, honorable mention should be given "Hello Frisco Hello"). RJ, I remember liking "That's Hollywood" when it played syndication. There was an interesting episode about Tyrone Power that actually had scenes of him in "Solomon and Sheba" I've not seen anyplace else. The mention of Leon Shamroy reminds me of an interview with him I once read. In his last question, the interviewer cited Shamroy's four Oscars (which I believe is still a record) and 18 nominations (a record he shares with Charles Lang), and asked if he ever made a movie for which he believed he deserved a nomination and didn't get one. Shamroy replied: "Hell, I deserved an Oscar nomination for every picture I ever made -- even Snow White and the Three Stooges." Ironically, most of the better Fox musicals were in B&W: Alexander's Ragtime Band, Tin Pan Alley, The Great American Broadcast and the always watchable (well, for me anyway) the shamelessly under-appreciated Wake Up and Live. I remember that Power episode too. It was after it had played out here in L.A. that I ran into Phil one evening at the local supermarket in West Hollywood and we talked about it. (I used to see Taryn, his daughter, there all the time, as well. We're pretty good friends now, and she lives in Wisconsin with her daughter). Anyway, I do indeed recall that footage from "Solomon and Sheba" which as I recall had some rough-cut footage of scenes that were of course never included in the final, but certainly represented the man's final moments on film. For me, it's a little ghoulish. I don't have that much trouble watching Jean Harlow's final performance in "Saratoga", even as one sees the scenes with her stand-in and the other actors like Gable standing around looking a bit dazed, but to see Power at the end in "S&S" is a little more than I can stand. While we're on this subject, I would like to say that they have now gone so far as to publish actual photos of that fateful day in Spain where the man collapsed on the set, which I find the most tasteless, ghoulish images I've ever seen. I'll take their word for it. I don't need proof. (I watched both my father, and shortly before that my mother pass before my eyes. I have spent years trying to blot it out. I feel the same way about those inages of Ty. This is really not how I care to remember him). By the way, I knew King Vidor slightly, the nicest kindest man you'd ever want to meet. Wish now I'd asked him about it -- at the time it was the farthest thought from my mind. 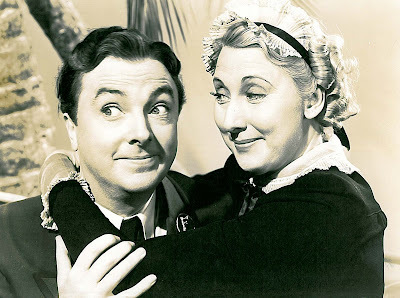 I agree with Mr. McCoy about the early B&W's being better by far -- the best Fox musicals were easily the pre-'40 ones, before they became obsessed with loud, brassy Technicolor spectales! As always this was a great (and unusual) and thoughtful post! The re-issue of GANG'S ALL HERE made me hungry for more Fox Technicolor musicals, but I didn't realize that the print I saw WAS processed in Technicolor and that other contemporary prints of Fox's color films wouldn't look like that.But whenever the out-of-town station had a 40's Fox color film I'd keep my eyes glued to the set, while my parents would complain about what a snowy picture I was making them watch.And Betty Grable died around that time.I was sad as she was only 56.Were even young legends not supposed to be alive anymore?I'd love to find out why there was no color TV print of GANG..., but there were color TV prints of older Fox movies like 1936's RAMONA.